I’m 8 years old. I live in Ashburn, Virginia with my sister, Ava. I enjoy playing with LEGO toys and being with friends. I also enjoy gaming. In fact, when I grow up I want to be a gamer or a real life superhero. At age 4, I was diagnosed with stage 4 neuroblastoma. What’s my favorite Candlelighters NYC experience? I can’t name just one. Everything we do with them is fun and memorable. We had a blast at the Halloween parties, shopping at Barbara’s house and relaxing on her couch after a hard and long day of treatment. My parents would say their favorite part is knowing that Barbara and her volunteers are like our family. They are our home away from home. 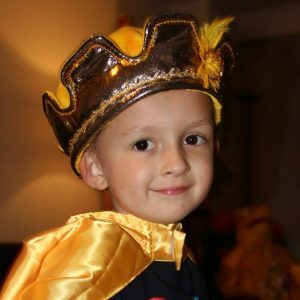 Click here to donate to Candlelighters NYC in honor of Trevor.